It's been a rough day for Netflix (NFLX). Shares of the movie provider opened nearly 10% lower today after it disappointed investors with last night's quarterly report. The numbers seem impressive on the surface. Netflix closed out the quarter with 25.6 million North American subscribers, 70% ahead of the number of couch potatoes it was servicing a year earlier. Earnings soared 58% to $1.26 a share, well ahead of the $1.11 a share that analysts were expecting. 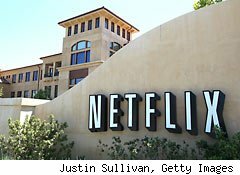 Customers who have been bellyaching over Netflix's recent decision to start charging substantially more for those who like to receive DVDs as well as stream video may be happy to blame today's stock slide on karma. There's more to it than that, though. You have to dig deep into the report to find the many things that are ticking off investors today. Please allow me to be your tour guide. Revenue climbed 52% to $789 million during the quarter, and that's just short of the $791.5 million Wall Street was targeting. Given the stock's euphoric run -- shares have nearly tripled over the past year -- it's easy to see how even the slightest miss can send bulls scrambling. But there's more to it than that. If revenue grew by 52% -- while its subscriber count surged 70% higher -- doesn't this mean that the company is generating less revenue per account? It is, but that's not necessarily evil. Netflix claims that 75% of its new subs during the period opted for the cheap, but high-margin, "streaming-only" plan for $7.99 a month. However, it also seems as if existing customers are trading down to cheaper plans. Margins matter, and the reason Netflix blew past Wall Street's profit forecasts is that it was particularly astute in milking as much revenue as possible down the income statement. Operating margins -- essentially a company's profitability before taxes and interest-related income and expenses -- clocked in at an impressive 16.3% domestically during the period. In other words, a little more than $0.16 of every dollar generated in revenue outside of Canada was still around after all of the company's operating expenses. It won't last. Netflix is telling analysts that domestic operating margins will fall closer to its 14% target. Lower margins translate into lower earnings, and this is where Netflix truly begins to disappoint. Netflix's outlook calls for net income per share to clock in between $0.72 and $1.07 for the quarter that began earlier this month. Analysts were banking on a third-quarter profit of $1.09 a share. Even if the company is spending to beef up streaming content and expand overseas, a miss is a miss. It's not the only forward-looking point where the pros feel cheated. Netflix expects to watch over just 24.6 million to 25.4 million domestic subscribers by the end of September. Back out the million streaming accounts in Canada, and Netflix had 24.6 million subscribers in the United States at the end of June. In other words, Netflix expects something between flat sequential growth and adding 0.8 million net new U.S. subscribers during the period. This is a sharp drop from the 1.8 million it landed in its latest quarter and the record 3.3 million that hopped aboard during this year's first quarter. If we go by the midpoint of its range, adding 0.4 million domestic subs would be Netflix's worst showing in just over two years. International expansion is a major component of Netflix's appeal. It rolled into Canada less than a year ago, and now has roughly a million accounts in the Great White North. It is aggressively looking to launch its service in 43 different Latin American and Caribbean countries later this year. Canada had a hot start, but things have been cooling off lately. After launching its streaming service during the third quarter, Netflix added 380,000 Canadian customers during the fourth. Just 290,000 net new accounts were tacked on during this year's freshman quarter, and a mere 160,000 net additions were generated this past quarter. The end result is that Canada is growing, but the rate is slowing (if there isn't a seasonal explanation for the slide). Netflix wants to wean subscribers off optical discs. It's far more lucrative to stream content than to worry about stocking DVDs, accounting for wear and tear, and paying for shipping in both directions. By splitting its plans in two, Netflix is hoping that more subscribers migrate to its streaming platform or pay quite a bit more if they want to enjoy both discs and online viewing. This is a gutsy move. Tech-savvy video buffs can decide to rely on Hulu Plus, Amazon's (AMZN) new instant streaming for Amazon Prime members, or Time Warner's (TWX) HBO Go for their streaming needs. Disc lovers can decide to switch to renting DVDs one at a time through Coinstar's (CSTR) Redbox or Dish Network's (DISH) Blockbuster. Cable and satellite television providers also have no shortage of new releases on demand. Netflix feels the time is right to test the stickiness of its streaming product, and it expects 22 million of its 25 million domestic subscribers by the end of this quarter to be paying $7.99 a month to access its streaming catalog. It sees only 3 million of its subscribers sticking exclusively to DVDs and Blu-ray discs. It's a pretty bold call to expect 88% of one's audience to be paying for a streaming product that was, until recently, included on unlimited disc plans at no additional cost. Netflix is a master of data. CEO Reed Hastings is a visionary. Those two aspects should combine to make the company a trustworthy source on its trend calls. Unfortunately, I'm not the only one questioning this aggressive product mix makeover. Today's tumble isn't karma. It's a horror flick. Longtime Motley Fool contributor Rick Munarriz owns shares in Netflix. Motley Fool newsletter services have recommended buying shares of Coinstar, Netflix, and Amazon.com, as well as buying puts in Netflix.